Bees aren't the only pollinators! Birds are part of the complex web of Nature, and each fits into this web in its own way. Some even pollinate flowers! While feeding at a flower, this Rainbow Lorikeet gets pollen on its forehead and throat. When it visits another flower of the same species, it transfers the pollen to that flower. The pollen fertilizes the plant's eggs to produce its seeds, and the plant's reproduction is assured. Learn more about the interdependency of birds and plants at CBSnews.com. Birds are part of the complex web of Nature, and each fits into this web in its own way. Hummingbirds are feathered sprites that can dart past you at high speed but then stop on a dime. The bird’s ability to hover lets it hang in front of a flower and probe with its long bill and tubular tongue, sucking up the nectar that provides essential nourishment. While feeding at a flower, a hummingbird gets pollen on its forehead and throat. When it visits another flower of the same species, it transfers the pollen to that flower. The pollen fertilizes the plant’s eggs to produce its seeds, and the plant’s reproduction is assured. Plants can’t travel about to visit one another, but pollinators can. In return, the plants furnish that important nectar. Hummingbirds are well known pollinators, but they aren’t the only ones. These Rainbow Lorikeets you’re hearing feed with their brushy tongues on the nectar of eucalyptus and other Australian plants. Lorikeets and honeyeaters in Australia, sunbirds in Africa, hummingbirds in the Americas: throughout the tropics and into the temperate regions, there are bird pollinators and plants that depend upon ‘em. You’ll find more about the interdependency of birds and plants on our website, birdnote.org. For BirdNote, I’m Mary McCann. Bird sounds provided by The Macaulay Library of Natural Sounds at the Cornell Lab of Ornithology, Ithaca, New York. Rainbow Lorikeet calls recorded by F.W. Loetscher; Anna’s Hummingbird call by T.G. Sander; wing beats by A.A. Allen. 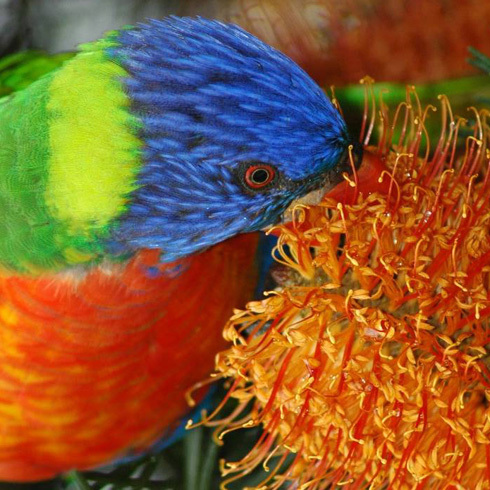 Rainbow Lorikeet - Learn more!